Harbro Clergy Stole. Approximately 56" x 5". Dry Clean Only. Also available in Deacon Stole. Tapestry, available in Off White. 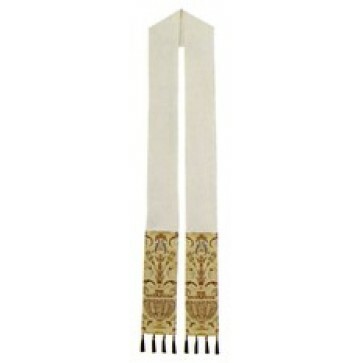 Off-White Tapestry Clergy Stole, made of soft, wrinkle resistant polyester. Fully lined and interlined for perfect draping, the length is approximately 56" x 5". Dry Clean Only. Also available in Deacon Stole.